This card is a CASE (Copy And Selectively Edit) of the card that I made for the Crazy Crafters Blog Hop with Alison Solven. Since we all CASEd one of her cards for that Blog Hop, this card must also be a CASE of her card! If you'd like to see Alison's original card, you'll find a link to it here. I love the owl from the Still Night Bundle! Combined with the neutral colours, it makes for a great masculine card. The owl from the Still Night Bundle is stamped with Bright Copper Shimmer Paint (apply some to a sponge brayer and roll it onto the stamp). The Still Night Bundle will be available from 5 September 2018 to 2 January 2019 in the Holiday Catalogue. 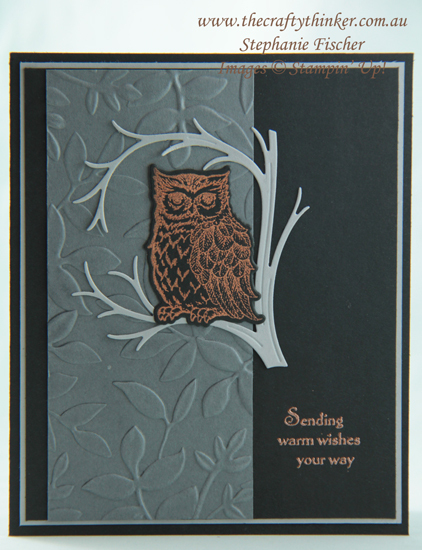 The Basic Gray strip is embossed with the gorgeous Layered Leaves Dynamic Embossing Folder. The greeting is copper heat embossed. I cut the branch from Smoky Slate cardstock and didn't want to waste the leftovers, so I used the negative space in this card.